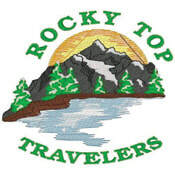 The Rocky Top Travelers is a WIT Club chapter in Tennessee. Anyone who owns a Winnebago, Itasca, ERA or Sunnybrook RV and is a WIT Club member is welcome to attend our activities and join this chapter. For additional information, please feel free to contact our club president. I hope everyone is staying warm in this usual weather the entire country is having. Just a quick note to bring you up to date on our campouts. For any new members, you will be making your own reservations. May 13-17 Bear Creek RV Park, 81 S Bear Creek Road, Asheville, NC. 828-253-0798 10 sites reserved. Each person must call in and make their own reservation by May 1st. )A list of activities with a flyer to follow. Sept 10-13 Creekwood Farm RV Park, Maggie Valley, NC at Lake View Campground. See attachment below for more detail. Hosts will provide more details as they are able. Rocky Top Travelers held it final business meeting for 2019 at the Beef & Barrel Restaurant on November 29th. Visit our Members Only section for meeting minutes. GNR is July 22 - 27, 2019 and WIT will begin taking reservations on March 1, 2019. Hopefully by then they will define a theme for this event. The WIT Tennessee State Rally will once again be held at the James E. Ward Agricultural Center, in Lebanon. The dates are October 17 - 20, 2019. This is a little earlier than normal, so mark your calendars. The Craigs and McKitricks have made arrangements with Creekwood Farm RV Park for our September Campout. Ten sites (#19-28) have been set aside for our members and will be held until July 10, 2019. The daily rate for these sites is $47. Discounts for Good Sam, Triple A, Military are offered. A one night, nonrefundable deposit by credit card is required when YOU make your reservation. It will be applied toward your stay. You can arrive before and/or stay after the Campout. Creekwood Farm RV Park is located off I-40 East, Exit 20, Hwy 276 South, Maggie Valley, NC.